The Sri Lanka Tea Board, collaboration with the Colombo Tea Traders’ Association, is organizing a number of celebratory events to coincide with this Sesquicentennial Anniversary, throughout the year 2017. 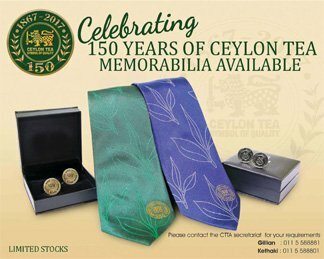 Memorabilia for the celebrations are available – Silk tie LKR 1800 each, Cufflinks LKR 2000 each. Contact Gillian on 011 5588881 or Kethaki on 011 5588801 to get yours now. Limited Stocks! A 24 hour celebration of tea hosted by the Sri Lankan missions abroad. 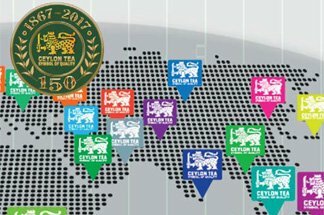 Sri Lanka’s tea industry, under the world renowned brand “Ceylon Tea,” celebrates 150 years in 2017, with a unique global 24 hour tea party on 06th of July at 5.00PM in every time zone from east to west across the world. This is the Sri Lanka tea industry’s opportunity to express its gratitude to all those people and organisatons that shared this journey with us and whose history is entwined with Ceylon Tea over the years. Come join us and be a part of the world’s first 24 hour tea party! Find a tea party near you. To register your venue to host a Global Ceylon Tea Party on the 6th of July 2017, please visit 150 Years Ceylon Tea - Tea Party and click on the link to register. Once you have submitted your details, we will be in touch with you to confirm your registration and to share a set of creatives which you can use to promote your own Global Ceylon Tea Party. We would like you to share your pictures and videos of the event, which we will share across all of our social media channels. Details for sharing event related content will be shared with you along with your registration. If you wish to submit any content before the event please email us at [email protected] along with your name and details of the content. 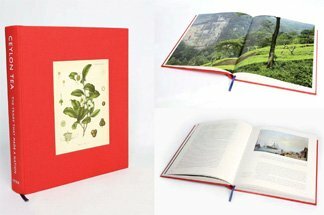 Launching on 20th July 2017 to coincide with the sesquicentennial of the Sri Lankan tea industry, Ceylon Tea: The Trade That Made A Nation is a comprehensive and readable history of the island’s plantation industry from pioneer times to the present day. Written by Richard Simon and published by the Colombo Tea Traders’ Association in art-quality large illustrated format with illustrations and photographs edited by Dominic Sansoni, Ceylon Tea: The Trade That Made A Nation tells the story of an industry whose fortunes and development are closely intertwined with those of modern Sri Lanka itself, tracing the links between the social and economic history of the nation and that of its most celebrated export. The Grand Charity Auction is also scheduled for 20th July 2017 to be held at the Bandaranaike Memorial International Conference Hall, following the Book Launch. Trust you will bid on the items listed below. The proceeds would be in aid of a charitable activity focused on Children of those within the industry particularly in the plantations. The eight Tea Brokers will have on offer, five lots comprising of the following items. 08th August 2017 – Registration for the Colombo International Tea Convention Opens, followed by an evening reception at the Cinnamon Grand Oak Room to welcome all delegates. The official Opening Ceremony of the Convention will take place at the BMICH main conference hall, followed by the first working session on Ceylon Tea. His Excellency the President will host a Tea Party in the evening. Will comprise of working sessions followed by a Gala Dinner in the evening. Will comprise of working sessions followed by a Beach Party. As part of the 150 year celebratory events, a unique day of ‘Ceylon Tea, Food and Music ’ has been organized at the Park Street Mews. This event is to promote the uniqueness of Ceylon Tea and the Tea Culture through a festive atmosphere with a focus on street events, tea stalls, food stalls, entertainment, performances depicting tea related activities to name a few are part of this exciting event. Many well known of tea companies will join in the celebrations. This event is for all Sri Lankans, Tourists, Expatriates and the Diplomatic Community. Do come, take part and experience this exciting event. Not to be missed. Entrance is free. ‘To Broadway with Love’. A musical recital featuring two foreign guest artists, Adam Jon from Australia and Karen Usha Gray from Canada. This recital will also feature Soundarie David, Soul Sounds & other leading muscians. Click here to visit the Sri Lanka Tea Board Events Page.